Victory! Seems the Mother of the Bride withstood the shop-a-thon better than me. She’s lovely and fresh as a daisy.. I’m…well…still standing. On this Mother’s Day eve, Fenelon Clan is caught in a swirl of excitement. Son #2 will very soon be married, and there’s much to do! 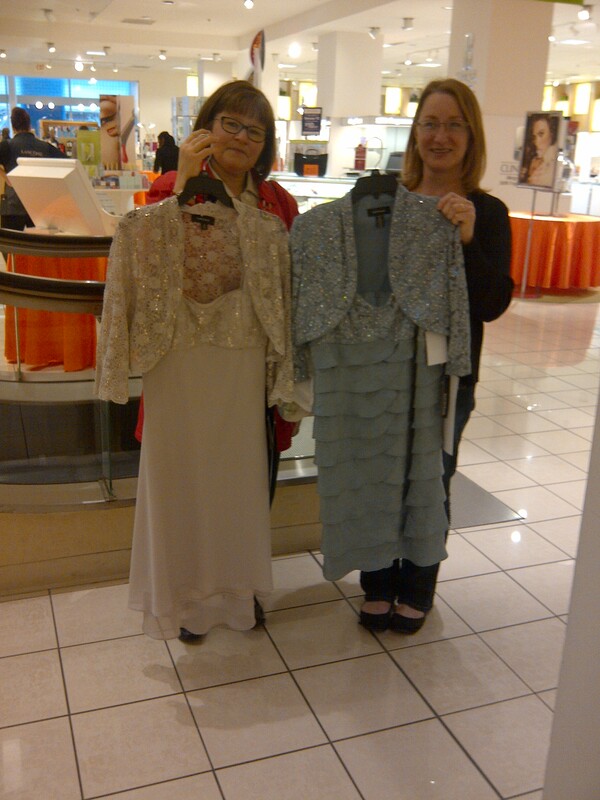 Yesterday, I was able to leap one huge hurdle – finding my Mother of the Bride dress and accessories! This was new to me, since nearly everything in my closet comes from a thrift store. You might say it’s a bit of an addiction for me. There’s nothing like the thrill of the hunt and the victory of cornering my prey – that one, unique, and right-priced item nestled in the gullet of the rack! So, shopping for new outfits in department stores was a mite overwhelming for this set-in-her ways middle-ager. The wedding attire hunt took twelve hours, minus 30 minutes for a lunch break. Yes, you heard me right. Twelve hours. The Bride, Mother of the Groom, my daughter, and I set out at 9:30am, positive we’d be returning home with our loot by noon. Ha. Right. My daughter was the lucky one – she found her outfit within the firs hour, hung out with us a bit and then scurried off to study for exams. I only wish we two moms could have been that fortunate. In the end, the Bride (after several bouts of scolding us to focus on our mission) had to take matters into her own hands and choose dresses for us. My jaw dropped. It was not in any way something I’d have chosen for myself, and the Mother of the Bride felt the same way about hers. But, you know what? Once we tried them on, we were sold. Literally. Audrey made excellent choices for both of us and we’re really pleased – and excited to wear them at the wedding! Next up was the shoe hunt. All I have to say is that nearly two hours in a shoe store is… enough said. If it weren’t for the Bride, both her mother and myself would be showing up at the wedding in tennies or bedroom slippers. These are not the shoes we would have chosen for ourselves by any means. But, you know what? Once we tried them on, we were sold. Literally. And we are ever-so pleased with the shoes! 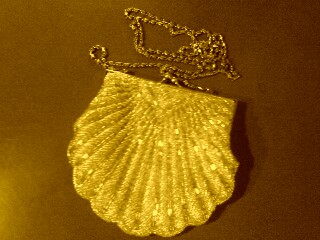 Thrift-store gem – a vintage seashell clutch! Finally… I needed a clutch purse. After a mini-supper break, off to the thrift store we went. Wouldn’t you know it? From behind a cluster of mangy old purses, Audrey pulled out a gem – a lovely seashell vintage clutch that perfectly accents the dress and shoes. Even though it was exhausting, our shop-a-thon was loads of fun. It also was a reality check. Playing in the background as we were flitting from store to store was this: From now on, Mother’s Day will have a new dimension for me. My kids aren’t little anymore; they’re fantastic adults paving their way in the world and I’m ecstatically proud of each one of them. What’s more, I’ll soon be a mother-in-law, and Fenelon Clan will have a new member. With this being the first marriage among our children, this is completely new for me. It’s wonderful, but very new. In a way, the new clothing I purchased yesterday was symbolic of the new role I’ll be taking on. Just like the dress and the shoes, it took a bit of getting used to, but I certainly love it. I wish all mothers – physical, foster, adoptive, and spiritual, a most blessed Mother’s Day. As I do every year, I’ll be praying for you during holy Mass tomorrow. May our Blessed Mother intercede in all of your needs and desires and may you grow more and more deeply into her tender heart each day. Happy Mother’s Day!